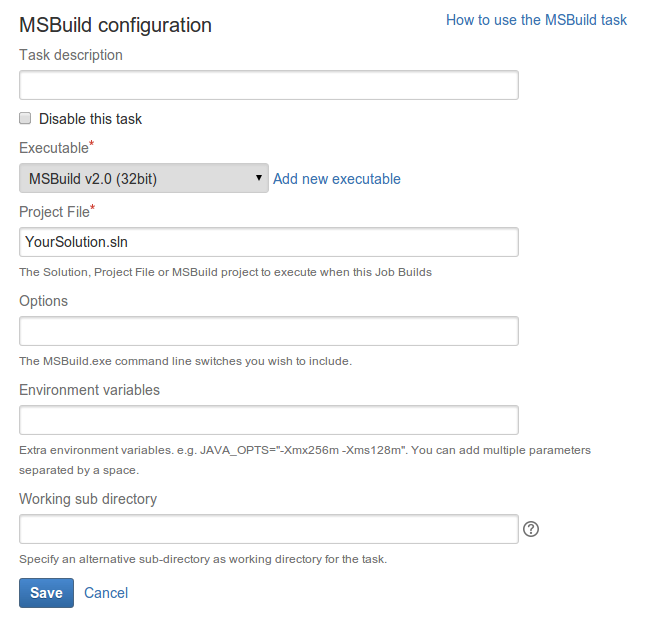 This page describes how to configure a Bamboo task to use an MSBuild executable. Note that you cannot use Clover to collect code coverage for MSBuild builds, as Clover only supports builders of Java/Groovy-based projects, such as Ant, Maven or Grails. A description of the task, which is displayed in Bamboo. The MSBuild executable that is available to perform the task. The executable you select will become one of the task's (and so, the job's) requirements. You can add other executables, if required. The name of the solution, project file or MSBuild project to execute, for example ExampleSolution.sln. You can include variables (see Bamboo variables). The MSBuild command line options that you want to include. By default, Bamboo 5.7 (and later versions) writes the contents of the Projects File and Options fields to an MSBuild response file. See below for more information. Additional system environment variables that you want to pass to your build. Note that existing environment variables are automatically available to the executable. You can also include Bamboo global or build-specific variables (see Bamboo variables ). Multiple variables should be separated with spaces. Parameters with spaces must be quoted (e.g ANT_OPTS="-Xms200m -Xmx700m"). An alternative subdirectory, relative to the job's root directory, where Bamboo will run the executable. The root directory contains everything checked out from the job's configured source repository. If you leave this field blank, Bamboo will look for build files in the root directory. This option is useful if your task has a build script in a subdirectory and the executable needs to be run from within that subdirectory. Check the 'Run as Powershell script' checkbox to run the script with Powershell instead of cmd.exe which interprets .bat files. The inline editor supports Powershell syntax. To disable use of the MSBuild response file, set the bamboo.plugin.dotnet.msbuild.useResponseFile system property to false. Do this on all Bamboo agents, and on the Bamboo server if you use local agents. If your Bamboo server runs as a service, add the system property to the <Bamboo home directory>/conf/wrapper.conf configuration file.